A native of Europe and western Asia, very widely planted as a shade tree and hardy throughout Michigan. First collected as long ago as 1892 in Washtenaw Co., but only becoming widespread as an escape in about the last 30–40 years. Now firmly established with seedlings or small trees large enough to fruit becoming more frequent in disturbed areas, at edges of forests, and in woodlots near urban areas. The seed end of the samara is very much flattened in this species, while in A. saccharum it is distinctly swollen. When live, the milky sap easily distinguishes it from sugar maple and black maple. 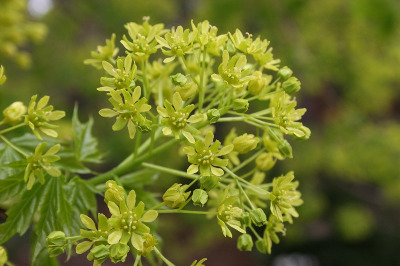 Numerous cultivars are grown, including some in which the leaves and normally yellow flowers are deeply suffused with red. The leaves stay green later into the fall than sugar maple and black maple, tardily turning a dull yellow. MICHIGAN FLORA ONLINE. A. A. Reznicek, E. G. Voss, & B. S. Walters. February 2011. University of Michigan. Web. 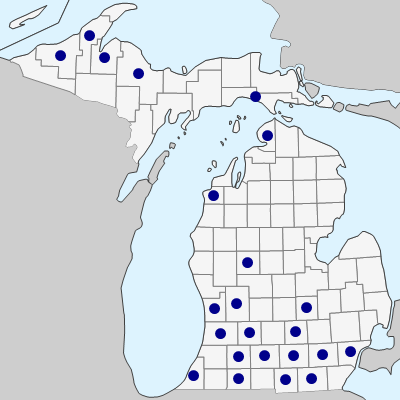 April 20, 2019. https://michiganflora.net/species.aspx?id=2652.